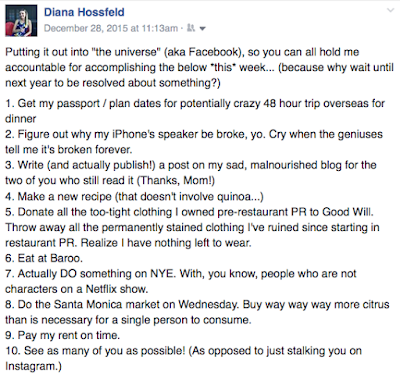 Last Monday I made the below list of ten things I wanted to accomplish during the post-Christmas, pre-New Year's lull, and then uncharacteristically shared it on Facebook with the request that my friends & family hold me accountable for achieving its contents. I didn't think anyone would pay much attention, particularly since there was no accompanying photo, reference to the new Star Wars movie nor anything of value to anyone other than me, but for some reason it seemed to resonate with people. The supportive response and comments, including those from friends who were eager to help me cross things off the list (strangely, only for the goals that involved food rather than, ahem, paying my rent on time), inspired me to not only take each item seriously, but gave me a fresh perspective on how I want to approach this new year. While I'm not one to make any specific resolutions along the lines of, say, spend less money at Blue Bottle, or commit to a dry January (Oh. The. Horror. ), the concept of resolving to be a better version of myself is always appealing. In years past I've told people that I aspire to say "Yes!" 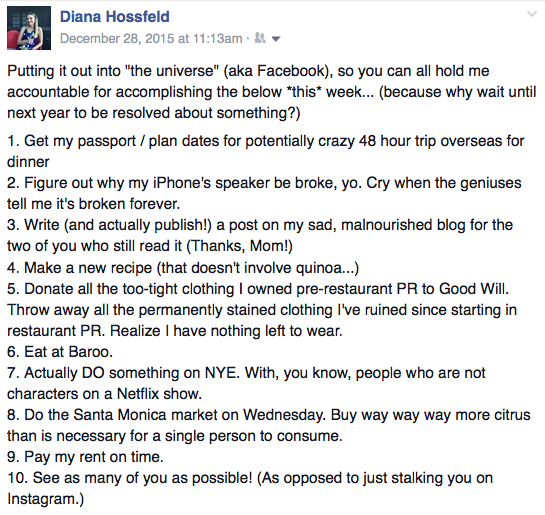 more than I say "No," but in 2016 I'm channeling the underlying philosophy that informed my incredible last week of 2015 with so many of my favorite people. Whether it be attempting a new recipe, planning a trip to someplace I've never been before, eating somewhere that is not a.o.c., Sqirl, Gjusta, or a client, or simply doing something outside my comfort zone (ie. an activity that doesn't involve eating or drinking), I want to move forward with this simple three-word anthem. What I discovered this past week was that much of my hesitancy to accomplish certain tasks was not necessarily attributable to a lack of desire, but rather to an aversion to being uncomfortable or, perhaps more potently, to some modicum of fear -- even if the fear was as minute as not wanting to get stuck in rush hour traffic on the 10 to get to the Santa Monica farmers market by 9 am. What if my iPhone really is broken forever, and I have to spend $500 to buy a new one, and it will be a total waste because the 7 isn't even out yet, and then when the 7 is introduced, I won't want to get it because I'll have just bought the 6? What if I go out on NYE and get stuck paying 9x the standard Uber/Lyft rate because of surge pricing, and then I'll never be able to go to Maude for the pistachio tasting menu? What if I ask someone to hang out, and they are "busy," but really just don't want to see me because the last time we got together I didn't want to order the charcuterie to share, and clearly now they think I'm lame and boring and also a meat-o-phob? Rather than letting these hyperbolic worst-case-scenarios undermine my progress, I opted to drown them out with my newly adopted anthem: Make it happen. And, with the exception of actually *physically* securing my passport (I filled out the application and have an appointment set for January 11th), and planning the exact dates for the proposed "crazy 48 hour trip overseas for dinner" (hint, hint, R and T), I ended up blowing through every item on my list. 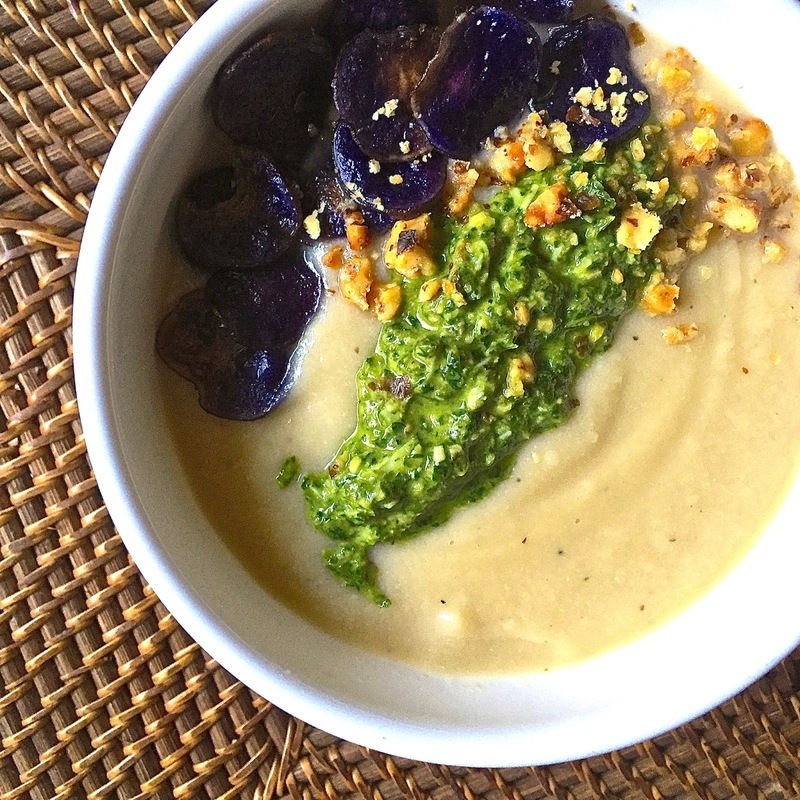 This soup recipe is my response to goal #4 -- a soulful cauliflower puree that I threw together on a whim, and then impetuously topped with leftover parsley walnut pesto and purple potato chips made from the potatoes I purchased from Weiser Farms at the Wednesday market. At the risk of being overly sentimental or obvious, the vibrant colors seem a fitting metaphor for the year that lies ahead. Here's to living without fear in 2016. Here's to paying my rent on time. And here's to making life happen… with all of you out there who don't think I'm a lame and boring meat-o-phob. In a large, heavy-bottomed pot, heat the olive oil over medium heat. Add the shallots and sauté for 4-5 minutes until starting to soften and brown. Reduce heat, add the garlic, and sauté for another minute or two. De-glaze the pan with the sherry. Add the cauliflower, vegetable broth, rosemary, thyme and pepper to taste. Simmer, partially covered, until the cauliflower is tender, approximately 25-30 minutes. Fish out the rosemary and thyme sprigs and discard. Remove the pan from the stove and using a hand-held immersion blender puree the soup until smooth. (Note: You can also work in batches, and puree in a vitamin or blender.) Return the soup to the stove to rewarm. Spoon the soup into each bowl. Top each bowl with a tablespoon of the pesto, a few purple potato chips, and a sprinkle of toasted walnuts. Peel roasted garlic. Combine all ingredients in a blender or food processor. Blend/process until smooth. Preheat oven to 375 degrees. Line a baking sheet with parchment paper. In a small bowl, toss the sliced potatoes with the olive oil, fresh thyme, and salt and pepper. Bake, turning once, until crisp, approximately 20-25 minutes. Cauliflower is not a big sell in our household - I’d have to eat the whole thing - but this does sound delicious.